Dog Poop is gross but we have to clean up after our dogs. 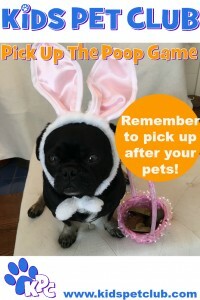 Over Easter we created a new type of Easter Egg Hunt to make the idea of Picking Up Poop more fun and rather competitive at the Canadian Pet Expo. You can play our live Pick Up The Poop Game with friends. See the post on how to play it HERE. An online Pick Up The Poop Game is Coming soon!